I am joining Kim at Kim's Big Quilting Adventure for Scrap Basket Sunday. While organizing stash a lucky find was pockets from an apron panel. The "scrap happy" block might become a runner or some other creation in the future. Am I the only sewer who sews an impulse block then wonders where it will live? This might explain my growing UFO pile. 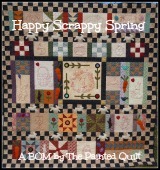 Karren at The Painted Quilt has designed a BOM called Happy Scrappy Spring. This should be a cheerful quilt and I love the embroidery. 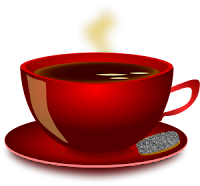 Sew put the tea pot on, grab a cuppa and join other Sunday scrappers. I love the first row of your Happy Scrappy Spring! I do this too, sew a block because I really want to try it out, usually from scraps, then it goes with nothing! Those usually end up in small quilts that I gift or sell on Etsy to buy more fabric! A lovely start, Fran. Oh, for a week of Sunday's, eh? This looks very pretty! It's nice to resurrect some of those impulses (I know all that!) and turn them into projects.